Will automatically fade your selected layers in and out. You can also have it rotate and scale the layers and choose to have the motion be linear or eased. The time in seconds to fade in and out. Select whether you want to affect the In Point, the Out Point or both. Specify how much you alter the opacity. Specify how much you alter the scale. Specifies whether to change how the rotation. If the expression is checked here easeIn and easeOut will be used. Otherwise linear will be used. Press the button to apply the expression for the selected layer. 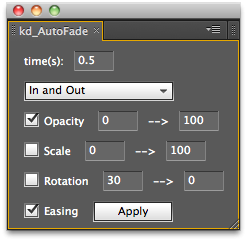 However, you can apply even if you have multiple layers selected.